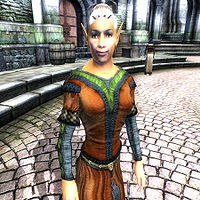 Elragail is a Bosmer bard living in the Imperial City's Talos Plaza District in the home of her friend Thamriel. Elragail will tell you she looks after Thamriel, who she claims is "touched by the gods". When she's not at Thamriel's house, she can be found wandering around the Imperial City; she frequently visits with Augusta Calidia at The Tiber Septim Hotel, and hangs out at The Foaming Flask. Elragail also travels to Anvil regularly to visit Countess Millona Umbranox at Castle Anvil; when there, she likes to stay at The Count's Arms. Speaking to Elragil for the first time will have her say: "My name is Elragail. I look after Thamriel. He's [sic] a little strange. 'Touched by the Gods', they say." Asking her about the Imperial City will have her say: "Thamriel says she hears voices. All the men and women who lived and died here for thousands of years... maybe they left ghosts behind." She wears middle class clothes consisting of a russet felt outfit and thick cowhide shoes. She carries burgundy linens, her house key, and a medium amount of gold. She uses a major leveled Illusion spell which is Chameleon, Invisibility, or Silence. When she talks to you for the first time, she refers to Thamriel as being male. Esta página foi modificada pela última vez à(s) 19h11min de 23 de julho de 2013.